Here's my WND article for this weekend entitled "Forever Young." A special thank-you to reader Katie J. who took the unbelievably moving photos of Liege Cemetery in Belgium. Another great article, and so very true. At least at this point, they (liberals) haven't done away with Memorial Day. 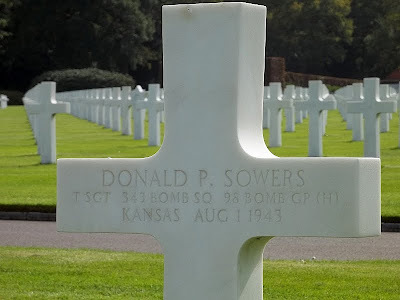 Have visited several American cemeteries over seas, and it is something to see. Does not take long to bring a tear to your eye. Have a great day at the Lewis farm. And the same to you, good lady. Thank you for your thoughtful recognition of this occasion. God bless you and your family. Wife (with mother in law) are away visiting her Grandfather's grave. He served in WWII, Korea and Vietnam and received a 21 gun salute at his funeral. A decorated solder but also a man who was haunted by the images of what he had seen and done for the love of his country. God Speed, Paul Villamoro. You are missed. Thank you, Patrice, for reminding everyone that Memorial Day is not a new mattress or new BBQ grill holiday. God Bless. We buried our old soldier at the beginning of January. My father did foreign service in Guam, Korea and Viet Nam. He was 87 when he died. His military service only 24 years out of a very long life where he did many other things, but that 24 years meant so much. It taught hims so much. Even more than the way he was raised by his parents it made him who he was for the rest of his years. Always aware of what his town, his state, his country was doing, he was always ready to jump into a breach. From stopping a store robbery once by grabbing the young stupid man with a gun in a choke hold, to knocking on his neighbor's doors to find volunteers for the election committee when the county was short handed, he was proud to be American and considered every thing this country did, right and wrong, as personal. His right to celebrate, his wrong to correct. He was buried at the National Cemetery where others lay who believed the same way, where he can rest in mighty company. The military taps ceremony was sharp, dignified, honorable. Simple and silent, it left most observers with misty eyes but large hearts. I looked out across all the gravestones in that vast field and it broke my heart. So many gone too young. So many brave and honorable who continued their lives to old age but it seems they're not being replaced with like kind. The Greatest Generation we call them now, these men who protected the world from such evil and danger. Are current and future generations raising men who will be willing to face the terrible work should we need them again? I'm so sorry you lost your father, but what a beautiful epitaph of a life well-lived. Be comforted. This was a life well lived. Honestly, we do have some who are following in their footsteps who have served in the Middle East. They keep "most" of the fighting there so we can be free to do what we do. There is no honor anymore in fighting our enemies. They have NONE. Sadly, even our media and other leftists are mostly in the same category. How is it that someone like Kathy Griffin can think a mocking photo of a decapitated President Trump is humorous or appropriate commentary? I hope she burns in that place reserved for the terrorists.